New for 2008, Terra Vida™ Brand of "living soils" brings all the benefits of organic farming and gardening to commercial landscape installations. Read on to learn more about this revolutionary approach to healthy soils and an even healthier environment. The Terra Vida™ Brand of living soils by TMT Enterprises represents a huge step forward in the way we treat all of our planting areas. Whether it’s a back yard vegetable garden, color beds, on-structure or even roof-top garden, the success of our plants depends on our ability to provide for the overall health of the soil we plant them in. 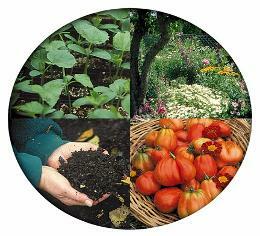 Healthy plants, healthy produce and a healthy environment all require healthy soils. Healthy soils require rich populations of tiny organisms, which perform many different functions. Without them, the soil is literally dead and your plants are likely not far behind. Each of the Terra Vida™ Brand soils is made up of a balance of all-natural materials. These products work together, creating the healthiest, most sustainable environment for plants of all types. Healthy plants and a healthy environment begin with healthy soils. The foundation of Terra Vida™ Brand soils is the rich biological diversity and nutrients found in our OMRI listed Organic Compost, OMRI listed Coir, Vermicompost (AKA Worm Castings) and our own proprietary blend of 100% organic OMRI listed fertilizers. These materials are teaming with microbial activity, are very rich in nutrients, aid greatly in moisture and oxygen retention in the root zone and are all sustainably manufactured. ©Copyright, 2008. TMT Enterprises, Inc. All Rights Reserved.